We cannot believe it has already been a year since April & Costa's beautiful garden wedding in Durham, NC! Over the past year, we were thrilled to see it featured in Southern Bride & Groom, Carats & Cake and InStyle Weddings. April and Costantine (“Costa”) chose the historic Sarah P. Duke Gardens for their fall, North Carolina wedding. The organic environment set the scene for a pond-side garden ceremony and a modern, nature-inspired reception with a Greek family-style dinner, and plenty of dancing under a clear top tent. Warm hospitality enveloped guests the entire evening, from the hearty and fresh Greek food and drink, to the lush ambiance, to the spectacle of champagne towers, chandeliers and dancing. April, Costa, and their guests were never found without a smile on this glorious evening! Wishing this happy couple a very Happy Anniversary and many more to come! April wore a rose-gold toned gown, traditional in shape, but intricately unique with vine patterns and unexpected sparkling details; the gown was perfect for the gilded garden party setting. 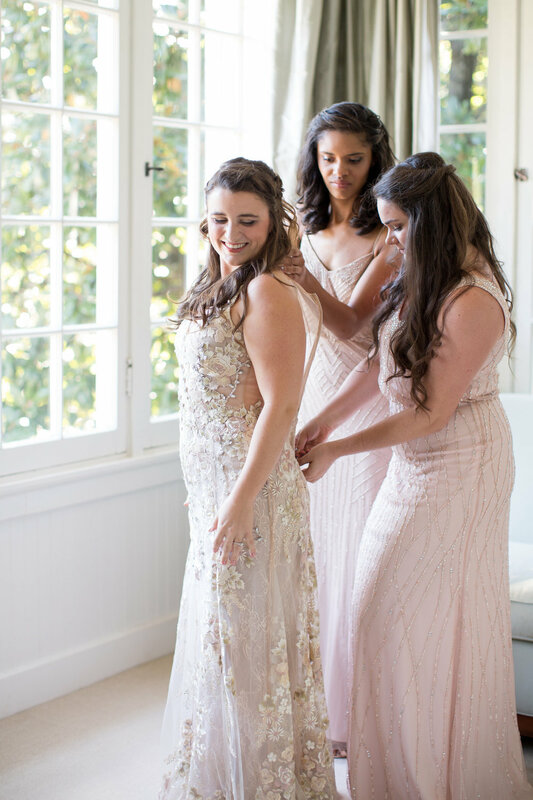 Her maids wore varying shades of evening gowns in dusty pinks and lavenders, pairing beautifully with soft neutral toned bouquets and trailing greenery. The amphitheater created an intimate setting for April & Costa’s 140 guests as they exchanged vows under a custom-made pergola with draping and greenery. After the ceremony, guests were invited to the lawn, terrace and tent, greeted with passed rosé, tiropita, and other Greek canapés. 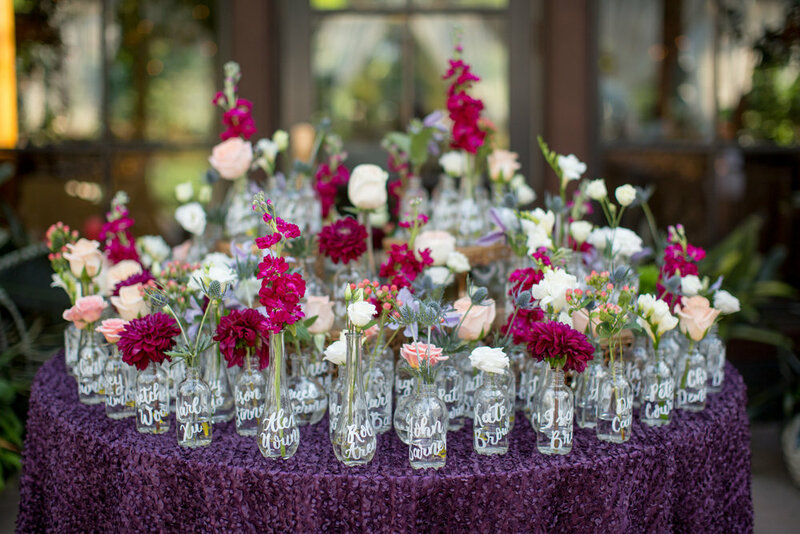 Guests found their dinner seating assignments at a table overflowing with fresh blooms in individual vases, each with the guests’ names hand-painted on the glass; a lovely memento for them to keep. The clear top tent, with elegant draping flowing in the autumn breeze, housed a custom bar, geometric and crystal chandeliers and inviting lounges for guests to perch and chat. The doors to the Doris Duke Center opened, and guests made their way into the dining room, where a glowing, modern garden setting came to life. Two oversized wooden chandeliers with pillar candles were engulfed in greenery and blooms and hanging geometric votives. Perfect pin spotting and up lighting created a soft glow on the lush centerpieces and the soft green, taupe and gold linens, like a midsummer nights dream. Each guests’ place setting featured a menu card exciting them for the Greek-inspired, four-course meal to come: stuffed grape leaves, zucchini Carpaccio, fresh bread and herbed olive oil, grilled lamb chops, mushroom couscous, halibut and roasted lemon potatoes. Guests then danced the night away under a giant crystal orb chandelier, with Greek dancing making way to classic party hits later in the evening.